Ordering Superfood? Superfoods like hemp seed oils and Lion's Mane have high levels of essential nutrients such as vitamins and minerals. These forgotten herbs and natural products, like mushroom tea, are available at the Dutch-Headshop. Superfood is indispensable for daily life. More and more people are aware of the importance of food for their health. Dutch-Headshop helps to get on the healthy food track with an offer of high-quality products, such as Hemp seed oil and Lion's Mane. Superfood, also called Powerfood, are health-improving food products. For many people, Superfood products are an indispensable part of their daily diet. Superfood contains nutrients important for the functioning of body and mind. Nowadays, these essential nutrients are scarce in our normal food. That's why Superfood is very popular now. Superfood products are unprocessed, and from organic origin. Because of the high level of important nutrients, such as vitamins, minerals, proteins, enzymes and antioxidants, Superfood has positive effects on the health. 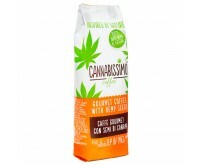 Dutch-Headshop has many Superfood products in its product range. Listed below are several important products. Superfood can be consumed in a number of ways. This differs per product. Hemp seed oil can be consumed raw, by taking in one or two tea spoons per day, though it can also be added as flavoring to soups or pastas, for example. Mushroom Coffee with Cordyceps or Lion's Mane can simply be used by stirring a bag in 200 ml of boiling water. The same is true for Lion’s Mane, Cordyceps, Chaga and Reishi Mushroom tea. These bags are also suitable for smoothies. The effect of Superfood of course depends on the product you are taking in. Still, many products have similar effects. For example, each products contains substances for a strong immune system. Furthermore, all products provide more energy to your body and mind, and it repairs deficiencies or imbalances present in your body. Superfood receives a lot of attention. As of this, many labels are related to Superfood products. All brands listed below are part of Dutch-Headshop's product offer. Be conscious about your food, and increase your general health with Superfood products from the Dutch-Headshop.